I know that we haven't even hit October yet, but I know that many Christmas Crafters and Jewelry Designers are already preparing for the Holiday Season, at least I know that I am. 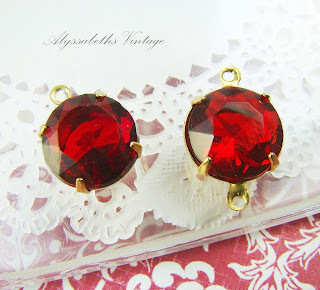 So, for the Jewelry Designer in all of us I've started adding some lovely Vintage Holiday Sparkle supplies in my shop, Alyssabeths Vintage! Bright cherry red vintage glass cabochons accented with crystal clear faceted glass rhinestones, perfect for your holiday jewelry and mixed media art creations. 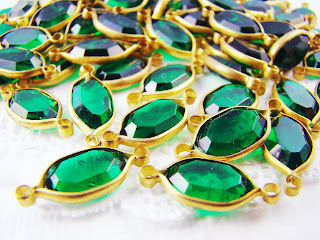 Elegant, vintage lucite faceted oval emerald green stones mounted in 2 ring brass channel settings (connector settings). These lovely findings measure 19mm long including loops/rings x 8mm wide, and have a lovely aged patina to the brass. Stunning, 11mm siam red vintage glass faceted Czech glass stones, jewels or rhinetones, just in time for your holiday jewelry creations. These 48ss stones have pointed, unfoiled backs and will be hand set in either 1 ring drop or 2 ring connector settings. Vintage Winter White Gold Starburst Snowflake embossed vintage lucite round 10mm cabochons! Perfect for your holiday and winter jewelry, mixed media or scrapbook creations! Perfectly flat backs, 10mm cabs. Hi Alyssabeth: You have some beautiful stuff at great prices. Where do you get your vintage supplies?